VUV Analytics Inc. 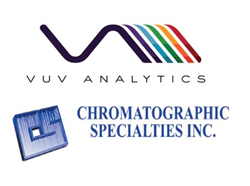 Announces Partnership with Chromatographic Specialties Inc.
VUV Analytics, Inc., manufacturers of the VGA-100 vacuum ultraviolet (VUV) detector, and Chromatographic Specialties, Inc. are pleased to announce a distribution partnership of the VGA-100 to Canada. For more information on the VGA-100, visit http://www.vuvanalytics.com for webinar recordings, product brochure, articles, and more.